There is some disagreement as to exactly what the name Cochlearia scotica refers to and therefore whether it really occurs in Northern Ireland. 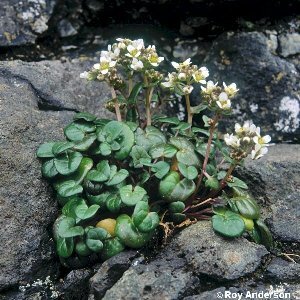 The records mapped here refer to plants which are like a small form of Cochlearia officinalis and are treated as a subspecies of it. They are quite widespread along the coast in short maritime turf and on exposed rocky and gravelly shores. Rarely found in the absence of ssp. officinalis, with intermediates reported from a few sites in the 1930s. 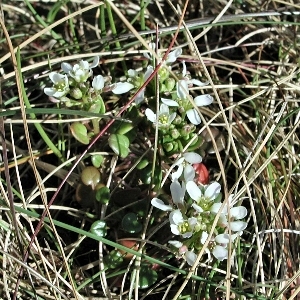 All names: Cochlearia officinalis ssp. 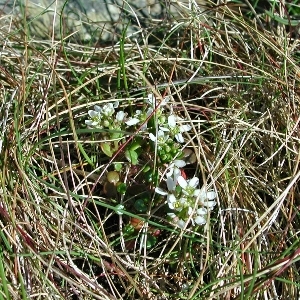 scotica (Druce) H.Watson; Cochlearia alpina (Bab.) H.Watson; Cochlearia scotica Druce; Cochlearia groenlandica auct. non L.